I often have a white chocolate bar for pudding washed down by a white hot chocolate drink. I've had an overload of puddings recently after Pancake Day, so I opted for this posh looking Milkshake White Chocolate drink from Marks and Spencer's. Cinabar keeps buying the odd treat from there as I can never remember whether they've stopped selling food or clothes, and she always reminds me that it's neither. Anyway, on opening the bottle I could smell a good whack of vanilla and then white chocolate mixed in with the milk. On taste this drink is clearly meant as a liquid pudding for those that prefer not to have alcohol. Stronger in vanilla than white chocolate in taste, this drink further chilled would make a superb ice cream. It's light, it's fluffy, it's creamy like a warmed up vanilla chocolate ice cream… Hang on; I think I'm starting to repeat myself backwards! 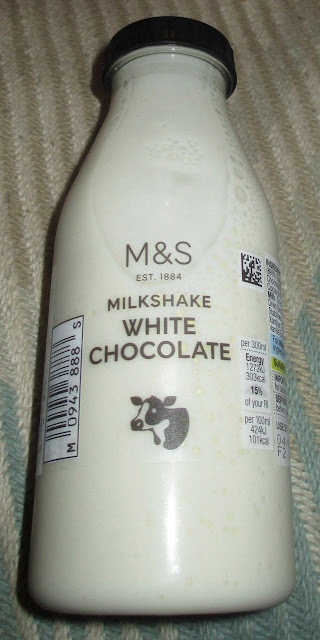 To quote the adverts (if there are any); "this is not just any Milkshake White Chocolate drink, the is an M&S Milkshake White Chocolate drink." This is not for kids mind you; it's just too good for them! Mwah hah hah…! The 300ml bottle contained 303 calories, 12.3g of fat, 35.7g of sugar, and 0.3g of salt. A good source of calcium and vitamin B12, the ingredients included; whole milk, sugar, white chocolate, cocoa butter, dried whole milk, dried skimmed milk, stabiliser; carrageenan, xanthan gum, and vanilla extract. How does it compare to Shaken Udder's Vanilla milkshake? I think that one is gorgeous, but it's a lot harder to find Shaken Udder than it is a M&S food section! i have had shaken udder but M&S white choclate takes the cake.